At the Interbike trade show last month, one of the big buzzwords was e-bikes. Short for electric bikes, the concept has elicited a lot of different reactions from the bicycling public. And this is honestly to be expected, as the cycling world is hardly homogeneous. 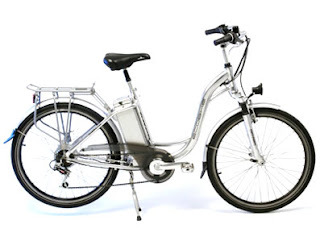 But not knowing anything about the e-bike other than it's a bike with some electric assist features, I decided it was time to find out something about them. And that took me to the Short North and Jared Cavalier at Segway of Ohio. Talking with Jared was a pleasure, as it always is when you're talking to someone with a true passion for what he's doing. And his passion is redesigning the way that we get around town, and making it easier for everyone to do. Segway of Ohio has Segways, of course, but they also have lines of other vehicles including folding bikes, powered skateboards, and the EcoBike. And the EcoBike, which is the brand of e-bike that Segway of Ohio chooses to carry, was my mission for the day. Before going in to see Jared, I did a bit of research, particularly this article from CNN and an Interbike TV interview with one of the founders of mountain biking, Gary Fisher. My initial reaction before reading the CNN article and watching the Gary Fisher interview was that these were just scooters with some pedaling ability, and that the only folks who were going to be using these were people who were simply too lazy to ride a "real bike." But both the article (which is accompanied by a segment on video, below) and the Gary Fisher interview revealed that these were a real option and that you didn't have to give up "real riding" by getting on one of these bad boys. Fisher's interview in particular reminded me of some of the reasons people give for not bike commuting, including having to change clothes, getting all sweaty, etc. We've discussed these before, naturally. And after having a chance to check out the EcoBike and test ride it, I'm convinced that this vehicle can be the answer that many folks are looking for. And after talking to Jared, I'm also convinced that my preconceptions about e-bike riders simply being wimps was not the case at all. First, a bit of discussion of the EcoBike. The bikes themselves come from Europe, where cycling culture is more accepted into the mainstream and bike companies don't focus nearly as much on recreation as they do here. Bikes in Europe, though they have the high-end mountain and road bikes, are generally more functional, and just another form of transportation. And the EcoBike follows that mold with one tiny difference: you get a bit of help while riding. EcoBike comes in three models in the US market: the folding Vatavio, the urban Elegance model, and the more rugged Adventure mountain bike model. All of them have a 36 volt Lithium Ion Battery and a 290 watt brushless rear hub that provide the assist. The wheels on the Elegance and Adventure model are standard 26 inch wheels, and the folding Vatavio has 20 inch wheels (which Jared said does tend to change the ride somewhat significantly, making it not quite as smooth as the non-folding models). Other than that... these things are bikes, pure and simple. Jared was pleased to point out that they are customizable with parts that come from any bike store (with the exception of the rear wheel which holds the motor in its hub and the battery casing). If you wanted to modify yours to include a Brooks saddle, change the tires to something a bit more sturdy (though they come with Kenda puncture-resistant tires), and put on some panniers, you can do so. If you want to put your kids in the Burley trailer behind the bike and get them to school or the park, you can. All the models come with a rear rack attached (complete with bungees), a rear light, a double-kickstand, full fenders with mudflaps, and a full chainguard. The motor is, as I said, fully electric - no gasoline required. A full charge takes 4.5 hours, and that'll last you for up to 25 miles of assisted riding (a term I'll explain momentarily). Naturally, your results may vary depending on your route, how much you pedal, etc. The battery lifts out of the bike easily and is about the size of a small shoebox. And if you are planning on some serious distance, you can get a second battery which fits perfectly onto the rack of the bike. Jared pointed out that the EcoBike does not have regenerative braking or any in-ride-recharging ability (like a hybrid car does), but that's one of the features that keeps it inexpensive. And inexpensive is, in this case, under $2000. Before you gasp, go to your local bike shop and look at the prices of even some of the mid-range road bikes - the cost is similar. So now the big question: how does it ride? Well... the answer is simple. It rides like a bike. I rode the Elegance - the urban model. And riding it felt pretty much the same as riding my current bike - which is a bit heavier than most bikes simply because I like sturdiness for my daily commute. I took the bike up High Street a bit, onto some of the sidestreets in the Short North, and up and down some hills in my test ride. The ride is very comfortable, even on the brick streets of the Short North. And pedaling without the power assist is, while not perfectly easy, not any harder than riding my bike when fully loaded for work. The six speed Shimano Tourney gears on the bike allow you to put the pedalling intensity right where you want it, and it shifts very smoothly with a twist grip. But putting the bike into assist mode was the most pleasant surprise of the day. As I pedalled away from the store, I was immediately propelled forward ever-so-slighly by the assist motor which gave me a little more "oomph" in getting off the line - solving a frequent issue mentioned by cyclists in that they feel they're holding traffic up a bit too much as they pull out. And going up the hills was much easier, obviously. You barely feel that there's any assist as you ride, but when your legs aren't burning as you hit the top and the flop-sweats fail to leave their mark on your work clothes, you'll appreciate just how much work the bike is doing for you. Top speed on the bike is about 20 mph (depending on conditions, of course), which puts it right at the same amount of speed as most bikes - thus (in my mind) removing the question of "do bikes like this belong with non-powered-bikes?" The answer is yes. As I said... this is most certainly a bicycle. And if you want to ride slower, that's no big deal either. Ride slower. The bike's not going to push you to go faster with its motor behind your work - it gives you a bit of help when you need it, that's all. To switch between assisted-pedal mode and full "scooter" mode is done with a flip of the right thumb. I wasn't particularly impressed with the full scooter mode - but then I'm a cyclist and don't have the same frame of reference there. And Jared said up front that it's not built to be a full scooter - it's a bike, period. I returned from my too-brief test ride with a new jones, so to speak. This bike is really the answer to a lot of questions regarding bike commuting. You still get exercise, there's no doubt about that. You're still moving and pedalling. This bike just makes the ride in traffic and among faster vehicles that much easier. I asked Jared about who the market for the EcoBike was and who was buying them the most, not sure what I expected as his answer, but was surprised anyway when responded "everybody above 30." And after riding it, I can see his point. Everything we teach in the League of American Bicyclists Traffic Skills 101 class still applies with an e-bike, because it's still a bike. As an instructor, I would have no problem with a student coming to class with one of these bikes. It has the same capabilities and limitations of a regular bicycle. But for those who don't want constant changes of clothing as they ride to and from work, want to arrive at work looking fresh and ready to go, or even have some physical challenges that might keep them off a standard bike (Jared mentioned that he has some nerve damage in his knee that keeps him off a standard bike), this is a more than acceptable answer. So don't fear the e-bike. Try it out and judge for yourself.